Every April we celebrate Earth Day and are encouraged to find new ways to recycle qualifying items, reduce waste, and reuse products in creative ways. 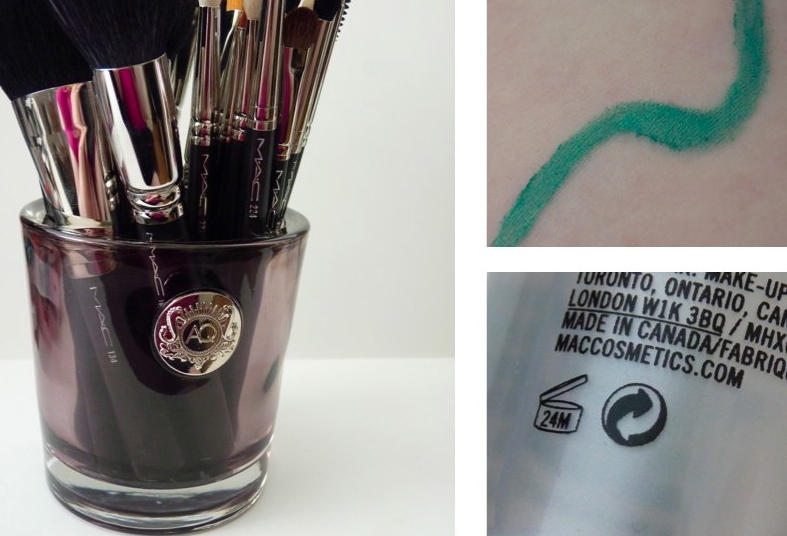 I thought I would provide a couple of beauty-related tips to being “green” and, of course, discuss this year’s Sephora + Pantone Universe Color of the Year: GREEN (emerald, to be exact)! My favorite candle company, AQUIESSE, houses many of their uniquely-scented, luxury candles in thick glass. After finishing my first candle, I could not bear to toss the glass container, so I cleaned it and started storing my makeup brushes in it. The smoked color of the glass fits perfectly with my decor and each container holds about 25 brushes (lip pencils and eyeliners also store well). As a scrapbooker/paper crafter, I have plenty of decorative paper laying around, and as my best friend reminded me this weekend, it can be used to cover coffee/soup cans, or any other container with a smooth surface. It is an inexpensive way to add a pop of color to your room, as well as organize/store frequently reached-for items. One of the reasons I continue to shop from MAC is due to their “Back to MAC” program. For every six empty containers you return, you will receive a lipstick, lipglass, or eyeshadow of your choice (MAC counters in department stores only offer a free lipstick). Let’s be frank, the mark up on cosmetics is immense, so when a large corporation offers its customers free FULL-SIZED products for bringing back the empty containers, they earn points for good customer service. I wish more companies would follow suit because it is a simple way to help the environment, as well as show some appreciation for our investment. Aveda is another eco-friendly company known for charitable contributions and various ways the company “strives to set an example for environmental leadership and responsibility.” Aveda offers liter-sized shampoos and conditioners, which not only “uses up to 66% less packaging” (compared to purchasing four 200 ml bottles), but also saves you 25% per ounce. I get a little giddy at an opportunity to save money on products I love! Sephora + Pantone Universe Color of the Year! As I have mentioned in the past, green is a color that makes me smile. I find the earthiness of it is quite soothing, so when Sephora + Pantone announced this year’s color as emerald, I knew it would be fitting for April’s Editor’s Note. The easiest way to add this bright green to your makeup look is by popping on an emerald mascare, or lining your upper or lower lashline with the color (keep the rest of your eye makeup neutral so the green shines!). If you are feeling a little daring, consider washing your entire lid with an emerald green, and use a deep blue in the crease and a shimmery gold in the inner corner to highlight. If you are not diggin’ the green makeup, consider getting lacquered up with the jewel-toned polish. Of course, the safest way to follow this year’s trend is by accessorizing with an emerald colored scarf or handbag. Lastly, If your birthday/anniversary is coming up, then flutter those lashes and beg your sweetie to purchase those Harry Winston earrings you have been eyeing ever since you saw them on the Red Carpet! So, whether you are trying to find more ways to conserve, wanting to accessorize with emerald, or simply feeling green with envy, this month I encourage you to go green! Posted on April 1, 2013, in AQUIESSE, AVEDA, BRAND, EDITOR'S NOTE, FEATURES, MAC, SEPHORA and tagged aquiesse, aveda, editor's note, features, mac, sephora. Bookmark the permalink. 2 Comments. I didn’t know about the Back to MAC program!! Thanks for the tip. Thanks for the candle recommendations!